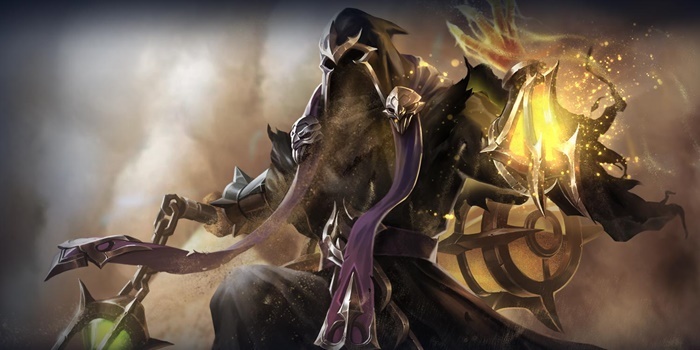 Having dominion over the desert, Samurai Gamers present an AoV Azzen'Ka guide to help players crush their enemies under the shifting sands. Good Multi-target Damage – Azzen’Ka’s abilities are strong against enemy heroes that are clumped together. Sand Punch can potentially knock up multiple enemies, while Dust Devil bounces between nearby enemies. Excels in Team Fights – All of Azzen’Ka’s abilities are extremely strong whenever a team fight occurs. He is particularly potent at disrupting enemy tanks and shutting down Marksmen and other Mages with his abilities. Decent Harasser – Being a ranged Hero, Azzen’Ka has an adequate ability harass foes, especially during the laning phase. He can zone out enemy melee heroes with his abilities, disabling them in the process so that his allies can then sweep in to finish them off. Extremely Squishy – As with most mages, Azzen’Ka is very fragile, and is susceptible to being quickly eliminated by heroes that deal strong damage such as Assassins and Marksmen. Low Mobility – Lacking any sort of movement ability, Azzen’ka will run into trouble whenever an enemy is able to close in on him. His only option when this happens is to slow or stun the enemy enough to slip away with his meager movement speed. Less Effective One on One– Azzen’ka’s abilities are all AoE and have been balanced to compensate for this fact. Dust Devil, in particular, is weakest when there is only a single target available, needing to bounce between enemies to get its full effect. Azzen’Ka is best suited to the mid lane, though can find use as a roaming support as well. His abilities allow him to clear minion waves very quickly as well as disable foes when ganking. Always stay in the backlines, harassing foes and disabling from a distance. Azzen’ka will go down very quickly if a foe manages to get close. Use Sand Wraith to set up team fights and skirmishes. Hit enemies in the vortex with Dust Devil to speed them along towards petrification. Start by focusing on Dust Devil. It gains more damage per level and is a more reliable ability than Sand Punch, even if Sand Punch gets more overall per rank. As with most heroes, take levels in Azzen’ka’s ultimate, Sand Wraith, whenever you can. Solo Battles: Azzen’ka is much weaker in solo fights than when going against several foes. Try to engage the enemy next to a minion wave whenever possible to ensure Dust Devil hits multiple times. Lead with Sand Wraith to slow the opponent down and start building up stacks for Sand Trap. Follow up with Dust Devil and Sand Punch to lay out as much burst damage as possible. If the enemy hasn’t fallen and has a sizeable amount of health left, use the time that they are petrified, slowed, or airborne to retreat from the fight. Team Fights: Lead in with Sand Wraith, aiming to trap as many enemies in the quicksand as possible. Follow up with Dust Devil for damage and Sand Trap stacks, finishing with a Sand Punch on the squishiest available target. Continue to siege enemies with Sand Punch and Dust Devil from afar, using teammates as meat shields. If available, use either Sand Punch of Sand Wraith to hold foes back as you try to escape. This is really Azzen’ka’s only option, not having any sort of movement ability. Sand Trap, when triggered, petrifies the enemy for 1.2 seconds. Spam abilities in order to trigger Sand Trap as much and as quickly as possible. Stack duration is 6 seconds. Multiple stacks can be applied immediately to the same target. Sand Punch – Azzen’Ka summons the shifting sands to attack his enemies, dealing 350/390/430/470/510/550 (+0.9 AP) magic damage and knocking them into the air. Due to its delay, players should aim Sand Punch in front of their target to ensure that it lands. If an enemy is petrified, wait for the petrification to wear off before hitting them with Sand Punch. Try to time it so that they are knocked into the air the moment they recover from the stun. Sand Punch has a 0.6 second delay before triggering. Dust Devil – Azzen’Ka sends a Dust Devil towards his enemies, bouncing between them and dealing 235/285/335/385/435/485 (+0.65 AP) magic damage. The same target can be hit up to 2 times, only taking 80% damage the 2nd time. Dust Devil is a great ability to use when enemies are close together. Doing so will ensure that each enemy is hit by the ability multiple times. Use Dust Devil to quickly add a few stacks of Sand Trap to the enemy and petrify them, making them an easy target to Sand Punch or Sand Wraith. Sand Wraith – Azzen’Ka calls forth the hand of shifting sands, dealing 200/260/320 (+0.7 AP) magic damage initially. The sand then starts to rage, continuously dealing 140 (+0.35 AP) magic damage to enemies within the target area and slowing their movement speed by 60%. Sand Wraith is a strong follow up to Sand Punch since it significantly slows down enemies caught in its area. You can alternatively use Sand Wraith first and then use Sand Punch on the slowed opponents to increase the chances of a group stun. Heroes caught within Sand Wraith are almost guaranteed to be petrified by Sand Trap if they cannot use an ability to escape. Similar to Sand Punch, Sand Wraith can be used as a disengage ability when you find yourself in need of getting away from enemies. Stay away from minions during the laning phase, as you will regularly get hit by instances of damage from Dust Devil. Sand Punch indicates where it will appear when cast. Upon seeing the circle on the ground, move away to dodge the ability. Avoid being hit with Sand Wraith’s initial cast. The first enemy hit will be at the epicenter of the resulting area damage and therefore have a very hard time escaping. Azzen’Ka generally runs a standard Mage Arcana set which uses Violate, Devour, and Hex. These ramp up his damage output while granting him a bit of sustain through magic life steal. Azzen’Ka can do well against tanks, whittling away at their HP with his abilities and hindering their movement at the same time. This isn’t advisable, however, as Azzen’ka should instead be focusing on locking down squishier targets. Similar to Tanks, Azzen’Ka does well against Warriors, so long as he maintains a safe distance and can hit them with his abilities. Watch your positioning as you lock down the fighters for your allies to clean up. Assassins are big trouble to Azzen’ka, able to get close and burst away his HP before he can do anything to stop them. Keep your distance and wait for allied tanks or warriors to engage on assassins before moving to attack yourself. Azzen’ka will need to play carefully against other mages, ihs own damage-over-time attack style not always the best match against burst mages. Again, wait for an ally to engage or a moment of surprise before locking them down. Luckily, mages are generally rather squishy and thereby vulnerable once petrified. Azzen’ka can do well against marksmen, provided he has careful aim. Sand Punch will interupt their attack stream and allow the mage to follow up with Dust Devil and Sand Wraith. Once petrified, marksmen will be completely vulnerable to attack, either from Azzen’ka or his allies. Support heroes are also susceptible to Azzen’Ka’s area of effect abilities,. If you manage to get them with your Sand Wraith + Sand Punch combo, your team can clean them up for a quick kill.